Jesus is said to have held up the model of a child in helping his audience appreciate what is required to “enter the kingdom of God,” by which he did not mean an afterlife in heaven but the liberated life here and now. Preachers have been exhorting their congregations to be like children ever since, which turns out not to be such good advice after all. The misunderstanding has to do with the difference between being childlike and acting childish. Jesus was elevating the childlike virtues of faith, wonder, and curiosity: engaging with life in this way keeps us present to what’s really going on. On the other hand, when we behave childishly we are decidedly not present to the mystery of the moment, but rather disengaged and spinning neurotically inside ourselves. In many of us there is a longing to return to that idyllic state, and perhaps not a few Christians regard our getting there a precondition of salvation itself (cf., the saying of Jesus). To put things in perspective, my diagram illustrates three ‘dimensions’ of human psychology. Our Animal Nature is where psychology is rooted in biology and the sentient organism of our body. At the other end of the continuum is our Higher Self where psychology opens toward self-actualization and ‘unity consciousness’ (i.e., our sense of All-as-One). 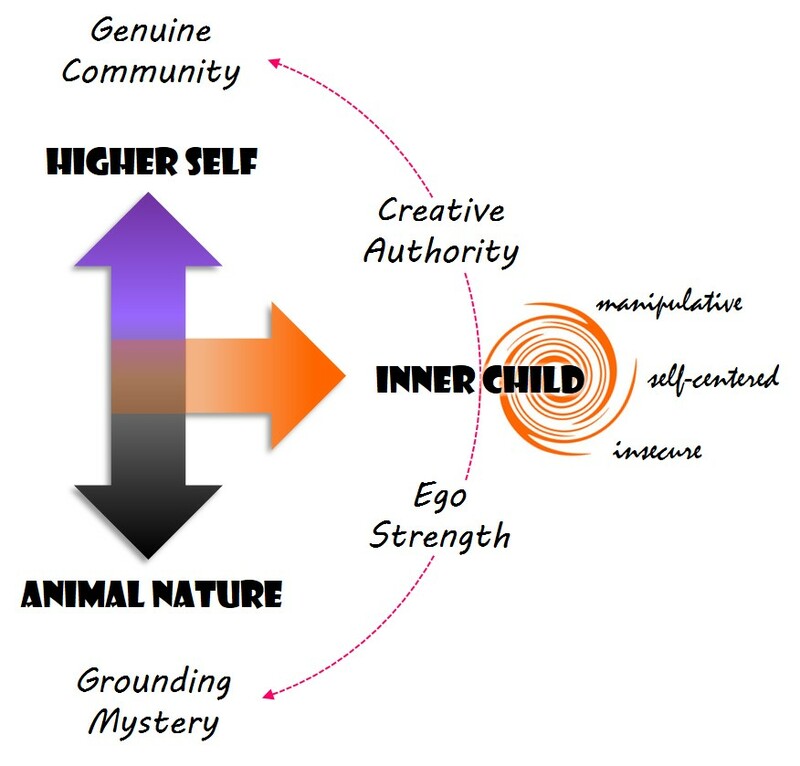 The development into maturity proceeds through a third dimension, where the personality individuates upon a separate center of self-conscious identity – the “I” (Latin ego) from which we take a uniquely personal perspective on things. 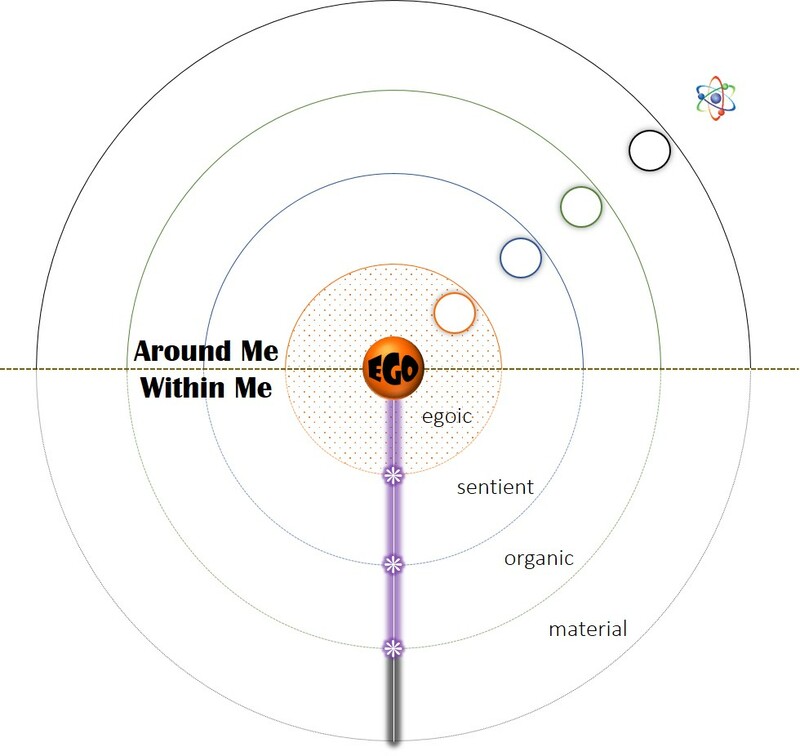 This third dimension of ego consciousness is strategically important to the awakening of our Higher Self, as it is from the vantage point of its center that we are enabled to look ‘down’ (or inward) to the grounding mystery of being, and ‘up’ (or outward) to the prospect of genuine community. 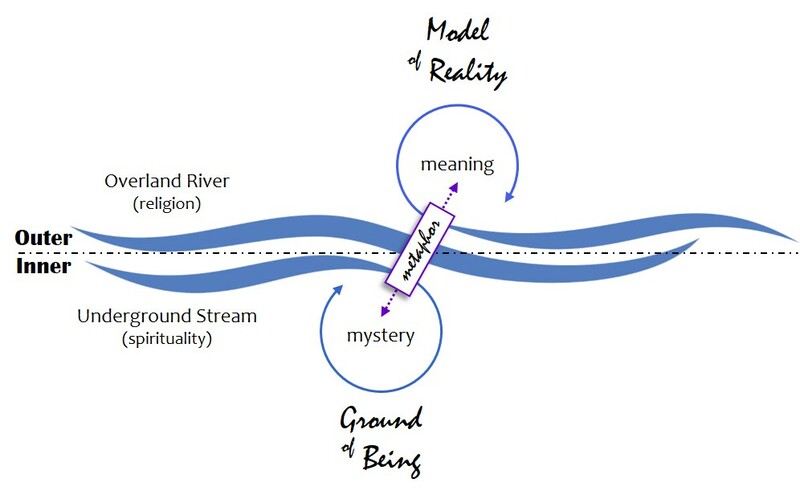 The distinction of these two ‘poles’ of the continuum of consciousness – a ground within that simply is and a community beyond that only might be – is necessary to keep in mind, as our successful transit will depend on how well things go with ego formation. For it to go well, each of us needs to achieve ego strength, which isn’t really an individual achievement so much as the outcome of a larger conspiracy of other social agents and forces, like our mother, father, other taller powers, siblings and peers. When this conspiracy is provident, our subjective need to feel safe, loved, capable, and worthy is adequately met, resulting in a personality that is stable, balanced, and unified under an executive center of identity (or ego). As we continue our growth into maturity, our centered personality gradually takes for itself the responsibility of constructing its own ‘habitat of meaning’ or personal world. Now the story of who we are (i.e., our personal myth) is ours to determine, at least to some extent, and we have full authorial rights. This is what I mean by creative authority. With a healthy individuated identity in place, possessed of ego strength and creative authority, we can choose to ‘drop’ from this center and into the grounding mystery within, or ‘leap’ from it in the interest of connecting in genuine community. Either move depends on an ability to get over ourselves, which in turn is a function of that emotional complex in our personality that was our primary mode of engaging with reality in those early years, but which is now our Inner Child. When things have gone well for us, the childlike virtues of faith, wonder, and curiosity continue to orient and inspire our adult life. We can surrender ourselves in existential trust, behold the present mystery of reality in wide-eyed astonishment, and explore its myriad features with an insatiable desire to understand. Such virtues are at the heart of not only healthy religion, but of our best science and art as well. We are less prone to confuse our constructs of goodness, truth, and beauty with the mystery that is beyond names and forms. Instead, they can serve as symbols and guidelines leading us deeper into that mystery where All is One. But if our early environment as actual children did not support our need to feel safe, loved, capable, and worthy, we devised ways of still getting at least some of what we needed in spite of the circumstances. A profound insecurity made us neurotically self-centered and motivated our manipulation of others for the sake of getting what we needed. For a while perhaps, it worked – but never entirely or for very long. These childish stratagems of behavior: pitching tantrums, sulking under the covers, telling lies, intimidating our rivals, cheating the system – whatever it takes to get what we want (“Trumpence”) – are now tucked away in the repertoire of our Inner Child. Whenever our insecurity gets poked, triggered, or hooked, our adult Higher Self gets pushed offline and this emotional terrorist takes over. This is the part of us that actually prevents our entrance to the kingdom of God. When we are in this childish mode, not only is our own grounding mystery inaccessible to us, but genuine community is an utter impossibility. Indeed, we have become its diabolical adversary. Not really if, but to the degree that we have this diabolical Inner Child inside us just waiting to get poked, it is of critical importance that we give sufficient time and mindful practice to the activation of our Higher Self. Scolding, blaming, shaming, and punishing ourselves and each other will only keep us stuck in the neurotic spiral. To make progress on the path, we need to remind ourselves – and occasionally be reminded – that it’s not all about us. 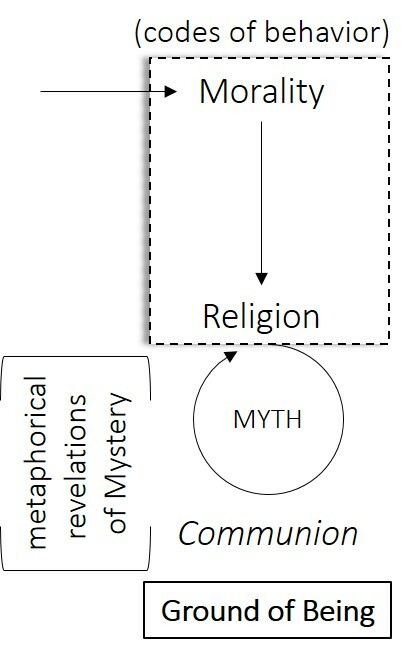 Religion is notorious for confusing its representations of God – our conventional nickname for ultimate reality – with the present mystery which, as they say in the Orient, is beyond names and forms. These representations, falling inside the general category of symbols, typically have their origin in experiences that can’t be definitively rendered in language. So an image is found or created, which serves as a reference to the unnameable as well as a mediator for the mystery to be experienced afresh. 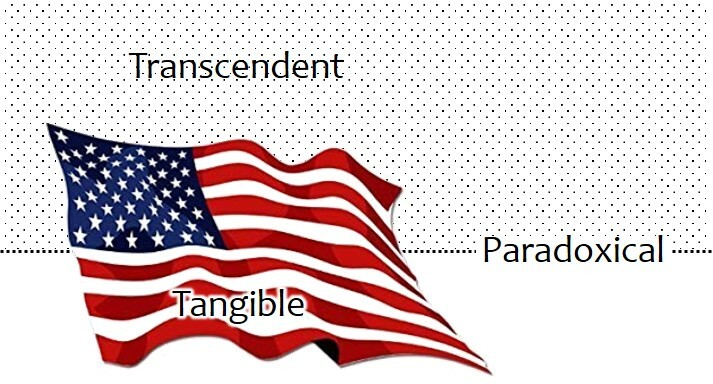 As a symbol, the flag has three distinct aspects that together are the secret to its inspirational and evocative power. In the foreground – right there in front of you – is the cloth and familiar pattern of color, stars, and stripes. This is the symbol’s tangible aspect. You can see it, touch it, and hear it flapping in the breeze. Other symbols might be more auditory than visual, as we find once again in the sphere of religion in the sacred utterance of God’s name or the holy syllable ‘om’, regarded in the East as representing being-and-becoming in a single sound. The tangible aspect of a symbol, then, is essentially sensory-physical: it’s right there. But the American flag also stands for something, doesn’t it? We say that it represents … what, exactly? If we answer “our nation,” then do we simply mean that Old Glory is a visual icon representing the living citizenry of the U.S.? Does it stand for the geographical landmass with its delineation of sovereign states? No, we are referring to something more – something other – than mere demographics and geography. Is it then simply the idea of America – the concept or mental category that names a sociopolitical entity, as one nation among many? Perhaps. Other nations have their flags as well, don’t they? This one represents Malawi, that one Switzerland, and so on. Maybe the symbol is just a handy label for an abstract idea. Actually, that’s fairly accurate when it comes to those other national flags. But isn’t there more going on with yours? Now it could be that Old Glory is nothing more to you than a pattern of colors on cloth, period. Using it as a dusting rag or painting tarp would be perfectly acceptable. No big deal. On the other hand, maybe for you the American flag is a sacred symbol, even if not quite religious (or it just might be). For you the flag represents a mystery commonly named “the American Spirit” – something intangible that makes the people here different and special. Not the living generations only, but also the generations past who struggled and fought for the ideals of freedom, justice, and solidarity, along with the still unborn generations of America’s future. Spirit is a perfectly appropriate term for this ‘something more’ represented by the American flag. This is the symbol’s transcendent aspect, referring to what “goes beyond” the sensory-physical object under your gaze. We find this word – this metaphor of spirit – used widely all over the world and from earliest times to speak of mystery. Literally it means “breath, air, or wind,” and it lends itself well as a name for what can’t be named, a mystery that is invisible yet evident in its effects. Like your breath, you can’t see the American spirit (or the spirit of God), but it moves in and out of what you are, giving life depth and meaning and linking you outward to all things. At this point it might seem as if we’re talking about two things: the tangible object of the symbol itself and its transcendent object. Even in my description above, it was difficult to keep my words from objectifying the mystery of spirit. In the metaphor of breath, air, or wind we still tend to regard it as something (i.e., some thing) external to us, a metaphysical or supernatural object perhaps, but an object nonetheless. What’s stopping us from thinking of it as a spirit? This difficulty is due to our insistence (or naivete) on interpreting the symbol in two dimensions (or aspects) only: There’s this sensory-physical thing here, and that elusive mysterious thing over there. Unless we’re careful, we are about to fall into the ditch of dualism where the mystery condenses into an external object and its symbol becomes an idol. I’m using the term to speak of what happens when something tangible, conditioned, and finite is mistaken for (or confused with) the transcendent mystery it was intended to represent. Once again, religion is only our most obvious example of this problem. For those who still honor it as a national symbol of the American spirit, our American flag is both tangible cloth and transcendent mystery. As an active and valid symbol, the cloth is sanctified and the mystery is manifested in its unique form. At the very moment of contemplation, the symbol serves to mediate for us an experience of mystery, of ‘something more’ that we can’t directly apprehend or rationally explain. We are grounded, connected, and included in something larger than ourselves. This phenomenology of symbol, with its inherent dangers of dualism and idolatry, applies across the various domains of human culture – politics, religion, business, sports, personal life, and even science. When the paradoxical tension of a symbol snaps, leaving us with two things to figure out, or just one (and only one) to command our worship, the symbol dies, and along with it the human spirit of which you and I are incarnations. Of whatever type, orthodoxy takes control as our ability (or tolerance) for living in the creative tension of paradox is lost. When all we’re left with are idols of orthodoxy, the long graceful arc of the human story will come to its premature end. Our most pressing challenge right now is not global warming, school security, or building a wall against Mexico. Somewhere in the DNA of all those troubles is an aberrant code which is undermining our success in working together for solutions that really matter. Simply put, we can’t work creatively together if we can’t get along; and we can’t get along if we ignore or neglect the practical wisdom regarding what makes for healthy connections. Genuine community is a chronic obsession of mine in this blog on creative change. It seems patently obvious to me that our human future is the future of all humans, not just a few or some. We may pin our hopes on a salvation by god or technology, but if we persist in our ignórance of what genuine community requires of us, in the end there will be no one left to save. Let’s see if we can get this practical wisdom in front of us and make sense of it. When it comes to healthy connections, which are what provide the conditions for genuine community to arise, the whole picture can be simplified as a balance of power and love. Unless there is a dynamic balance of these two factors a relationship will not be what I’m calling a ‘healthy connection’, and consequently it will compromise rather than empower genuine community. Both you and your partner need to be in positions of power for your relationship to be healthy. As I’m using the term here, power is not associated with dominance, aggression, or manipulation, but is instead the virtue of inner strength that results from being securely centered in yourself. Thus centered, you have direct inner access to your own human needs, individual voice, and personal will. What we call the human spirit is channeled not only through what makes you both human (your basic needs), but also through what makes you unique persons and different from each other. ‘Voice’ refers to the expression of your individual perspectives, interests, and choices. A healthy connection honors how each of you ‘leans into life’, as we might say. ‘Will’ includes your personal desires and commitment to what you want to ‘make real’ (or realize) through active intention. When you and your partner are each centered in all three – your needs, voice, and will – your relationship can become the synergy (1+1=3) of what you both bring to the encounter. We have to qualify the statement by saying that synergy is still only a possibility at this point because the other factor in the balance has yet to be considered. Love is the willingness (recall that will is power) to make room for – literally to “accommodate” – the needs, voice, and will of your partner. Staying true to yourself and remaining centered in your own power is thus counterbalanced by a commitment to protect the right (and responsibility) of your partner to do the same. Admittedly this definition of love sounds less like the warm affection and ardent regard that are traditionally identified with it. But in the balance of power and love which is the heart of a healthy connection, love does not simply play the ‘soft and gooey’ to power’s ‘hard and prickly’ stereotype. 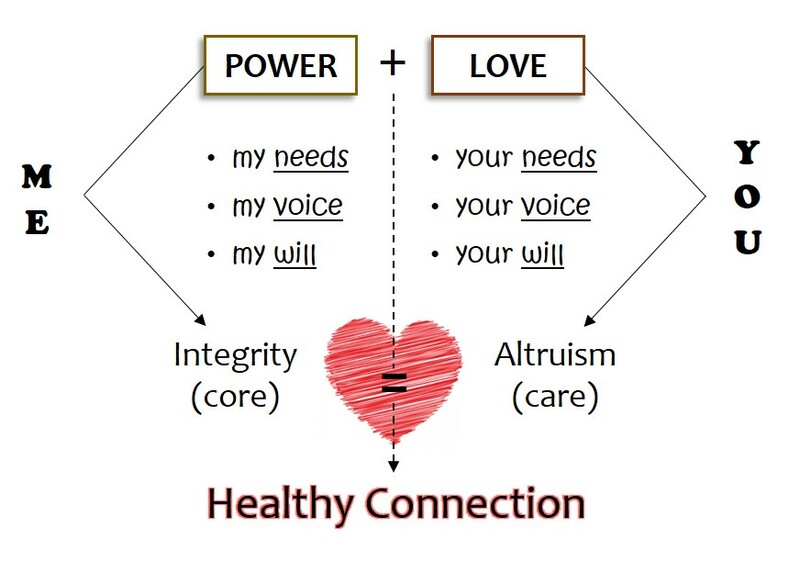 While power is a function of your own integrity, love (as altruism) is opening to your partner as an equal, respecting her needs, listening to his voice, and including his or her will in your shared construction of meaning (or dialogue). In short, love means that you genuinely care. To the degree that you are stuck in the stereotypes of ‘prickly’ power versus ‘gooey’ love, these essential factors are difficult if not impossible to balance. Add to this the fact that you, insofar as you are a normal person, tend to lose your center when the forces of stress and change threaten your security – which you then try to recapture by manipulating the world around you – it’s not surprising that ‘power grabs’ are your strategem of choice when things break down. I find it interesting the way our Western mind has parted-out power to business and politics, love to morality and religion, and truth to science and philosophy. This evident schizophrenia – whom can we trust to reveal what really matters? – is presently keeping us as a culture from the grounded and responsible orientation in reality that we seek. Such a creative re-orientation will come as we are able to join together in genuine community. One day we will engage a dialogue and co-create a world big enough to include us all. That day will indeed be the dawn of a new age. Before that day can come, however, and as we struggle in these ‘end times’ of our present age, one against another, we will need to learn how to honor the sacred balance of power and love. Only this truth can set us free. When you turn your attention outward you will notice that external reality is home to many different kinds of beings. There are other human beings like yourself, busy making meaning and managing their identities. You will also find other nonhuman animals who seem relatively free of the neurotic compulsions that afflict your species. Many of them can sense and respond to the environment and appear to possess an emotional intelligence very similar to your own. In addition to such sentient beings are botanical and nonsentient organisms that certainly are alive but lack nervous systems and are presumably incapable of perceiving, feeling, and suffering in the same way. Finally you’ll notice a preponderance of other things which are neither living, sentient, nor self-conscious: atoms, elements, and compounds in various combinations and admixtures providing structure to everything else. Science is currently learning more about the quantum dynamics of energy inside matter itself, calling into question long-standing assumptions regarding its stable predictability. 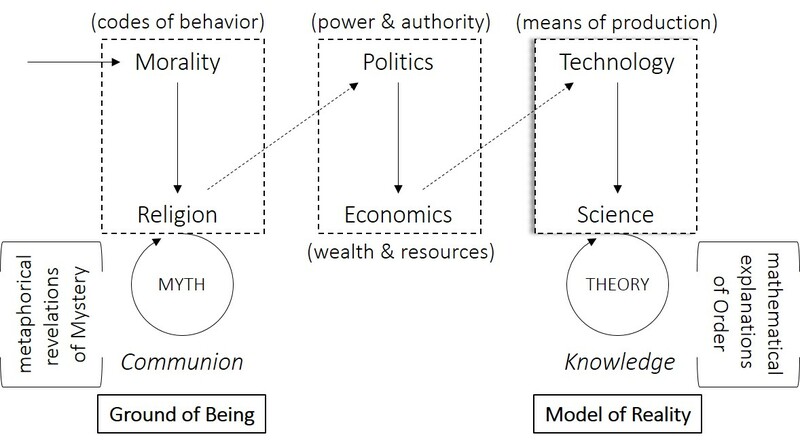 In the upper half of my diagram I have arranged these five realms of being, ranging from the most recent arrival (egoic) to the oldest and primordial substratum of energy itself. The origins of our universe are way out there, and with each evolutionary era another realm came into being – matter first, then life, followed by consciousness, with self-conscious identity showing up in the last second of cosmic time. Altogether, this reality is arranged around you and includes you. It is the vast field of scientific observation and research. You may never come to realize that there is another dimension to reality, beyond the five realms but not outside them. For many, this inner dimension is almost inaccessible, but not because it is so profoundly esoteric. Rather, their access to it is limited by a condition of ego entanglement. Quite often, their early experience in life failed to instill a sense of security, or perhaps it was upset by abuse, loss, or neglect. To compensate for this missing security, they latched on to whatever they expected would provide some comfort and stability – mother, pacifiers, and blankets were eventually replaced by social acceptance, approval, and recognition. Ego entanglement, then, has two distinct aspects: (1) your own insecurity and (2) the web of attachments that give you an insufficient and temporary measure of consolation – insufficient because nothing outside you can supply the existential security you lack, and temporary because, as the Buddha realized, nothing is permanent and everything changes. A tragic number of individuals (perhaps including you) are stuck inside this ego realm, driven by insecurity and captive to attachments and convictions that will never satisfy. In the longer historical run of religion, it’s only been fairly recent that everything got skewed and tethered to the insecure ego. Depravity, shame, guilt, and damnation came to define the human condition, and the entire cosmos was construed as backdrop to the drama of salvation whereby the sin-sick soul is redeemed and delivered to an everlasting security in paradise. Our late-comer to the stage has bent the whole shebang to its neurotic need. Actually there is a way of liberation. I don’t say ‘another way’ since that rescue scheme leads nowhere but more hopelessly into entanglement. The true path involves breaking free of entanglement, which also means letting go of attachment and getting over yourself. But this isn’t easy, if only because so much is wrapped up in (or entangled with) your strategies for consolation. The counter-logic of this path of liberation invites you to plunge into your insecurity rather than seek escape from it. Begin by noticing how much of the ego realm is made up of beliefs, and then let yourself see the extent to which every belief is made up. The world you have constructed around yourself is not how things objectively are, but rather how subjectively you need and expect them to be. This self-centered construct of meaning consists of nothing but stories you are telling yourself. Don’t feel badly about it, for this is how each of us – and all of us together – make life meaningful. We spin its web out of ourselves, out of our imaginations, and then proceed to pretend it is real. Don’t spend too much time trying to understand how this is happening or justify what you’ve done. Once you come to see that who you are and the world you have constructed around yourself are projections of your imagination, simply let yourself drop out of that web and into a present awareness of this moment. Released of its tether to ego (“I”), consciousness can now fully indwell your senses and nervous system. Here is the step on the path of liberation that has proven most difficult for many, and for two reasons. First, the requirement to let go of your ego projections means surrendering what you’ve been hoping will make you feel secure. Such a ‘naked fall’ can be terrifying. Secondly, what you’re falling into is the internal state of your nervous system, and this is exactly where your insecurity, as chronic anxiety, is registered. This is why the rescue scheme of religion as well as other more common coping strategies of distraction and addiction seek to get us out of the body or anesthetize its nervous system. But you can let go. And what you will find as you settle into the body is that your nervous state is supported by a still deeper grounding mystery. Just as your personal identity (ego) rests in a sentient system that is many millenniums old in evolutionary time, so this conscious awareness itself rests in a primal network of organic rhythms and urgencies that reaches back many millions of years to the early emergence of animal life. Attend to the rise and fall of your breath. Listen for the faint drumbeat of your heart. Follow the guide of your animal body as it leads you even more deeply into the present moment. This threshold between urgency and silence, fullness and emptiness, being and nothingness, ground and abyss – is a holy and ineffable place. The brand of humanistic spirituality I ascribe to regards human beings primarily as creators, and what we create is meaning. This brings in another key concept as it relates to meaning itself, which is that meaning is created – or constructed and projected – rather than intrinsic and merely awaiting our discovery in objective reality. In short, existence is meaningful because (or to the extent that) human beings make it so. A high prevalence of depression, suicide, and relational conflict in our day especially suggests that we are not as successful in making meaning as perhaps we once were. It could be a function of the fact that our worldview is much more complicated now, along with the stepped-up media campaigns to bring as much bad news to our attention as possible. On the other hand it’s possible that our modern worldview is not complicated as it is fractured – pulled apart and lacking an integrative center. But if human beings are meaning-makers (aka storytellers, knowledge builders, and world creators), then our contemporary experience of chaos may not so much be happening to us as caused by us – or at least it might be a consequence of our abdication of creative authority. Something’s going wrong, and I’m not responsible! Even though human beings have always been responsible for the meaning of life, it’s only been in the last 100 years or so that we’ve become self-conscious of doing it. Prior to our awareness of culture, worldview, and the meaning of life as purely human constructions, we imagined other beings as bearing the responsibility for creating worlds, establishing moralities, setting destinies, and supervising human affairs from above. Our disillusionment in this regard coincided with the revelation that we have no one to credit or blame but ourselves. The rise of constructivism, of the theory that meaning is constructed by human creators, has therefore brought with it a heightened sense of accountability – not to whom so much as for what. Our world(view) and life(style) promote either harmony or calamity, wholeness or conflict, wellbeing or anxiety, happiness or depression, genuine community or neurotic isolation in some degree. Whereas in previous centuries and generations these conditions seemed to simply happen to us, we are now beginning to understand that we are doing it to ourselves (and to each other). We know now that somebody once upon a time had made it all up, by formally posing or else quietly assuming authorship as seers and privileged witnesses to exclusive revelations. Their stories of cosmic origins, tribal beginnings, cultural foundations, and future apocalypses were (and still are) great artistic construction projects of meaning designed to provide context, orientation, identity, and perspective for their contemporaries. For the longest time subsequent generations simply accepted their narrative portraits as ‘the way it is’. But as I said, once we started to recognize the human in this all-too-human design, the veil came down and our modern angst over meaning commenced. This also explains the fundamentalist backlash we are seeing in religion today, as true believers strive to recapture the earlier mindset of mythic-literalism and thereby reestablish security in a world of divinely warranted truths. I’m arguing that our way through the current chaos and insecurity will decidedly not involve going back to an earlier worldview and mindset. Instead we need to go forward – through the falling veils and deeper into our disillusionment, until we come to full acceptance of our creative authority as meaning-makers. As we do, we will realize that meaning is multi-faceted – not monolithic, absolute, and universal as we once believed – and that the more facets we consciously attend to, the more meaningful our project becomes. 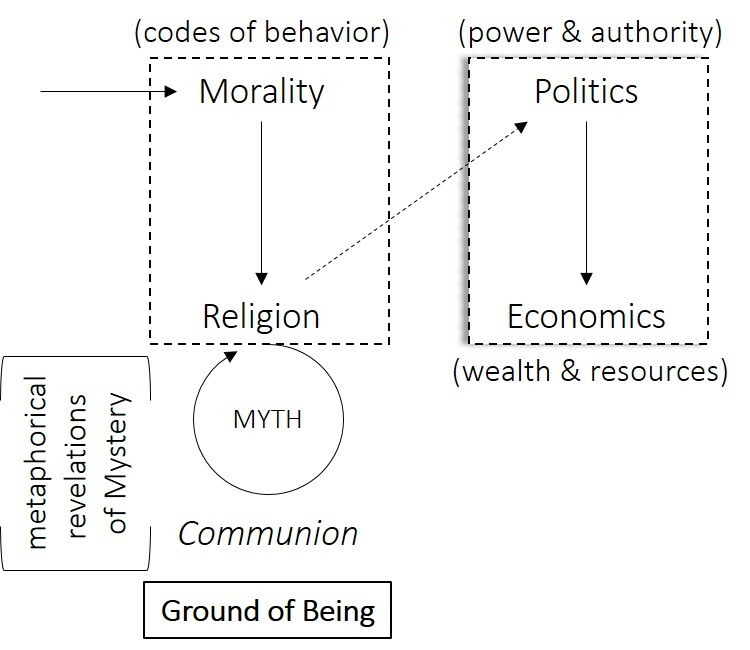 My diagram illustrates what we can think of as the Gem of Truth, consisting of five such facets of meaning. We can, if we so choose or naively assume, focus on one facet to the exclusion of the other four, but then our sense of meaning will be proportionately diminished. When all five facets are included, our worldview and way of life will be meaningful in the highest degree, simply because we are accepting responsibility as creators. Let’s look at each facet in turn. One facet of meaning has to do with the fact that language (our primary tool for making meaning) is essentially a system of signs – of ideas, phonemes, and logical operators that refer to other things. In some cases these other things are terminal facts in objective reality, such as that thing over there. But in the foreground, between our mind and that over there, is a complicated cross-referencing web of signifiers, linking, classifying, and defining what it is. Once we arrive at the objective fact, that supposed thing-itself, we will find it flinging our mind outward to still other things – into a vast background and expanding horizon of inferences, reminders, and associations, as far out as our curiosity will take us. Just as the root-word ‘sign’ is our clue to the facet of meaning called significance, in the way it refers or alludes (as signs do) to something or somewhere else, importance contains the idea of importing something from elsewhere. Although we commonly use these terms interchangeably, their etymologies argue for a critical distinction. Significance refers out into a larger field of knowledge and concerns, as importance brings just one or a few of those concerns into the course of our personal life. A fair amount of our general anxiety and depression today may be due to an inability – amounting to a lack of skills, priorities, and filters – to discern what really deserves to be taken in (imported or downloaded) out of the information explosion going on around us. Many of us are simply overwhelmed by the data noise and can’t tell what’s truly important. 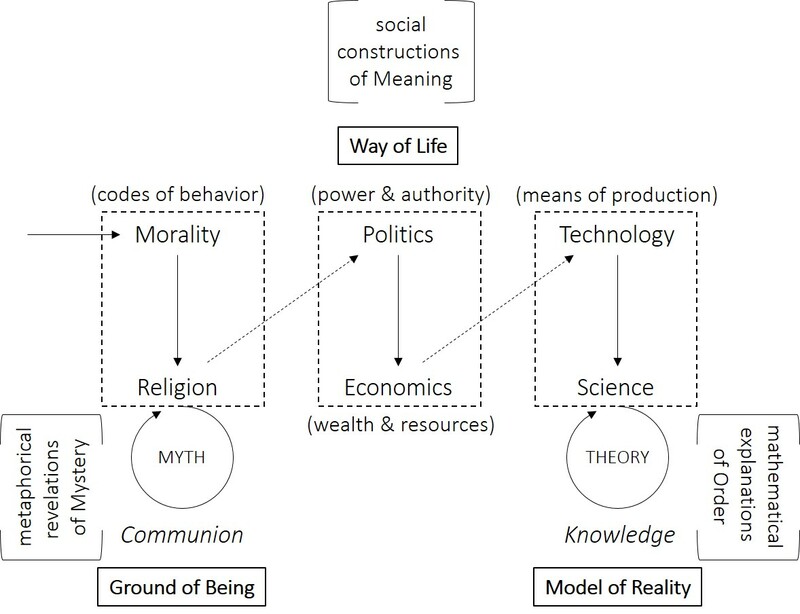 A third facet of meaning has to do with its connection to the basic requirements of survival, health, and wellbeing. Meaning is necessary when it speaks to and satisfies our genuine needs as human beings, persons, partners, and citizens. This is where much of the problem lies with respect to fundamentalism, whether in religion, some other cultural domain, or our individual lives: the outdated worldview and mindset no longer addresses our current needs or offers guidance through today’s social landscape. Characteristically it will deny or ignore our real needs as it works to coerce compliance with a belief system from another time and place. But because every belief system is anchored in a mythology and every mythology assumes the framework of a cosmology (theory of the cosmos) behind it, importing such beliefs requires the rejection of modern science and what we now know about the universe. Meaning in life, and a more general meaning of life, must not only speak to our real needs; it should also support and promote what is wholesome, helpful, favorable, salutary, and useful – in a word, what is beneficial. The root bene- means ‘good’ (deed) or ‘well’ (done). A truth is more meaningful to the degree that it enriches our lives and adds to the general good. The final facet in our Gem of Truth that commonly gets confused with significance and importance asks to what extent something is relevant. There is a critical distinction here as well, which must not get lost in translation. 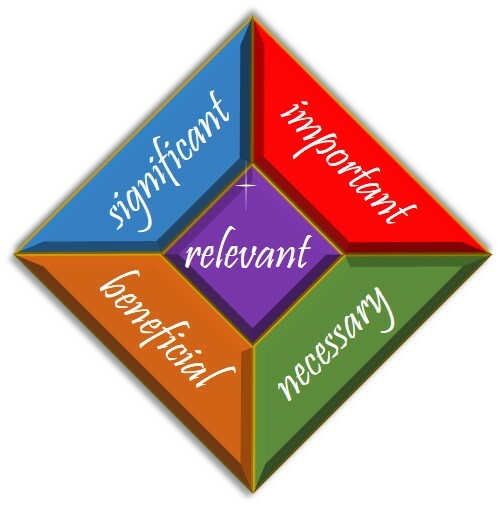 Relevance is more situational than these other facets of meaning. If something is significant in the way it refers us out into a larger field of knowledge and concerns; and if its importance is in the way it affects or impacts us more personally; then we can say that something is relevant insofar as it “bears upon or connects to the matter in hand” (taken from the dictionary). Many things once significant and important are no longer relevant – or at least not to our present situation. The question “So what?” is typically seeking the meaningful application of truth in the context of our time, this place, to the challenge I’m facing now. Education fails most miserably when it leaves this question of relevance unanswered – or, worse still, when it dismisses the question itself as irrelevant! As we step self-consciously into our creative authority as meaning-makers, we need to know what makes life truly meaningful. No longer can we ride passively inside the worldview of someone else, or from another age. Neither can we afford waiting around for everything to fall back into place – because it won’t. Hunkering down defensively behind the bulwarks of denial or conviction will only intensify our anxiety and deepen our depression. It’s time to start the conversation and lift a new world into being.